As the four men knelt before the altar, priests moved past – young and old, hale and frail, in the various stages of their lifelong commitments – pausing at each to lay hands solemnly on his head and confer to him the gift of the Holy Spirit. 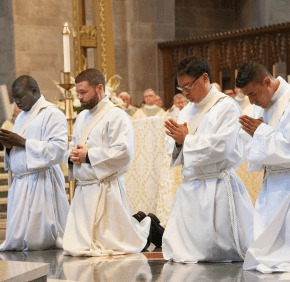 The ancient gesture was part of the sacrament of Holy Orders, through which the four kneeling men – now Father Carlos A. Osorio, Father Christopher U. de Leon, Father Francis M. Ouma and Father Joshua D. Laws – became the Archdiocese of Baltimore’s newest priests. Father Osorio, 31, said that the laying of the hands was the most moving part of the June 20 liturgy at the Cathedral of Mary Our Queen in Homeland. “It’s when you really feel the power of the Holy Spirit,” he said. Father Laws, 30, who grew up a parishioner of St. Stephen in Bradshaw and has been active in the archdiocese throughout his life, was also moved by the joy and intensity of the laying of hands. Father Laws will spend the summer at Holy Family Catholic Community in Middletown. “Your answer didn’t merely indicate that you made it to the church on time to be ordained,” the archbishop said, his subtle deadpan coaxing gentle laughter inside the cavernous cathedral, which was fully packed. After the archbishop’s homily, the four men were presented as candidates for ordination. They placed their hands in those of Archbishop Lori, promising respect and obedience to him and his successors. In an expression of their total dependence on God, they prostrated themselves on the floor before the altar as several hundred faithful chanted the Litany of the Saints. After the laying of the hands, by the archbishop and dozens of other priests, the four men were vested with the stole and chasuble, signs of the priestly office. Father de Leon’s parents reciprocated the conviction. Due to visa difficulties, Father Ouma’s parents, who live in Uganda, were unable to attend their son’s ordination, but he has plenty of supporters stateside. Monsignor Lloyd E. Aiken, pastor of Sacred Heart in Glyndon, vested him at the ordination. Father Ouma, 29, performed pastoral duties at Sacred Heart and was sponsored by the parish for his ordination. In 2009, the Catholic Review followed Father de Leon and two other seminarians throughout their first year of studies at St. Mary’s Seminary in Roland Park. Read part one, part two and part three of the award-winning series, which covers the joys and struggles of preparing for the priesthood.